Become a Master Gardener Volunteer! Would you like to get involved with the community? Do you love gardening? Are you interested in sharing your knowledge with others? If so, you should become a Master Gardener Volunteer! Master Gardener Volunteers are people just like you who have an interest in gardening and wish to share their knowledge with others through volunteering with Cooperative Extension’s consumer horticulture education program. If you have any questions please contact Joanna Radford, Surry County Cooperative Extension Horticulture Agent, at (336) 401-8025 or by email at joanna_radford@ncsu.edu. 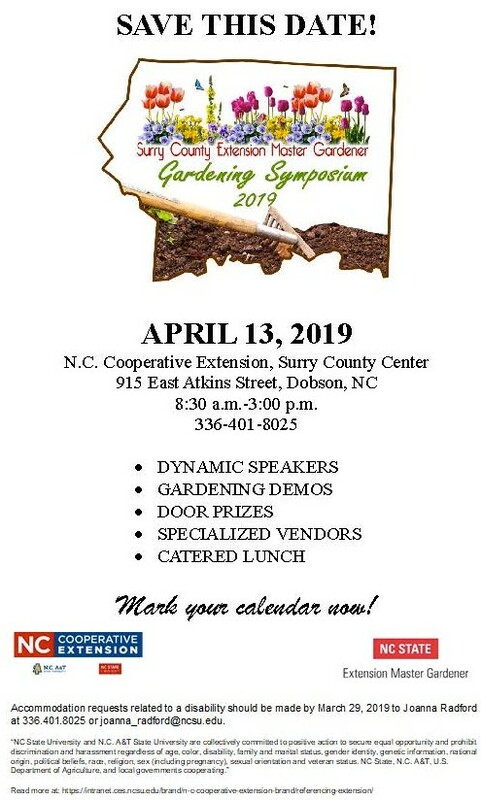 The NC State Extension Master Gardener Volunteers, Surry County will be hosting a gardening symposium on Saturday, April 13! The symposium will consist of dynamic speakers, gardening demonstrations, door prized, and specialized vendors. The cost of registration includes a catered lunch. Registration is now open! Please click here for more information and to obtain a registration form! Registration deadline is April 6. Save the date for the upcoming gardening symposium hosted by NC State Extension Master Gardener Volunteers, Surry County. What does it mean to be an Extension Master Gardener?